It seems lately that I haven't been so inspired to sit in front of the computer and write. I'm inspired to cook good food (especially good food just for myself), and enjoy eating good food (even if it is a solitary lunch alone in my dining room), I'm just not so inspired to take to the Internet and brag about it. I wonder if it has something to do with my mothering instinct, that I can take the time to labor over soaking and sprouting and fermenting things, but not necessarily to tell the masses about it. Perhaps it is the primitive need to nourish and carry on without the trappings of the digital age. Meanwhile all sorts of little triumphs have happened in my kitchen, for instance my picky-eating boy is starting to break out of his shell and at least try new things. Most of the time, it ends in confession that he likes something new. In part, this is because I stopped catering to the whims of both of my boys and I just cook food. There is good food here and if you are hungry you will eat it, or at least try it. St. Patrick's Day potato and kale colcannon (via The Domestic Man and his tantalizing facebook photo of it) didn't go down so well with the picky-kid, but the roasted cabbage and Outpost-made Irish sausage on the side did... and when I disguised the leftover potatoes and kale into a creamy cabbage/broccoli/"spinach" soup, it got demolished without comment. 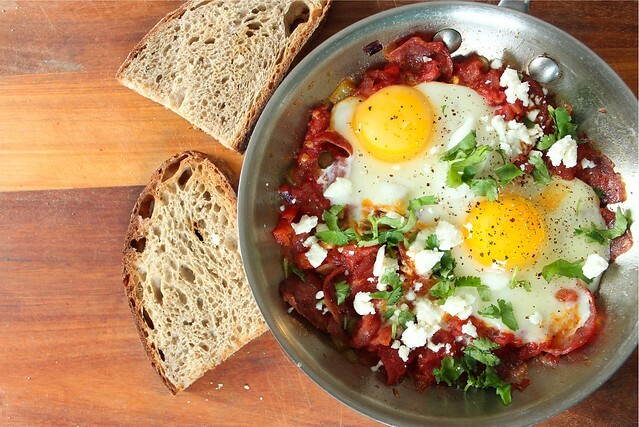 I had hoped for the same for this shakshuka I was planning with the Bolzano salami I received recently to play around with. A group of local food bloggers were challeged to come up with 2 recipes each using some real-deal, hand crafted, local salami. 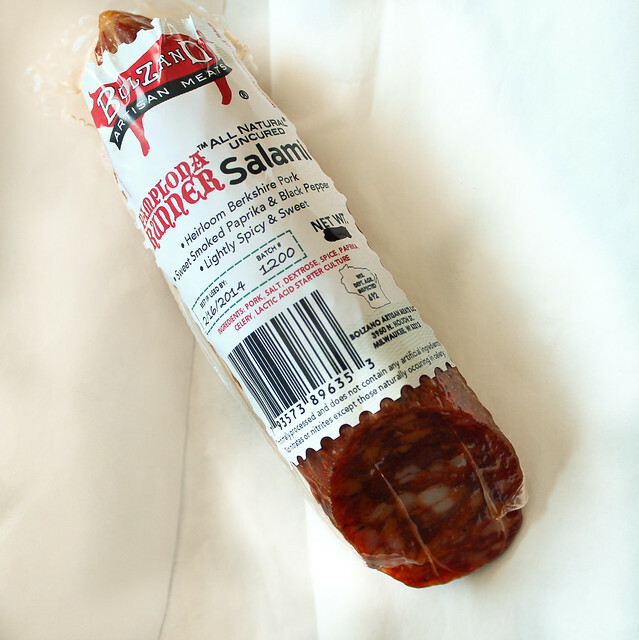 I signed up for the Pamplona Runner salami, which I hadn't tasted before. While I awaited it's arrival, I thought back to some of the early PBS watching days of my pregnancy, the days when food didn't taste good unless it appeared already made before me. 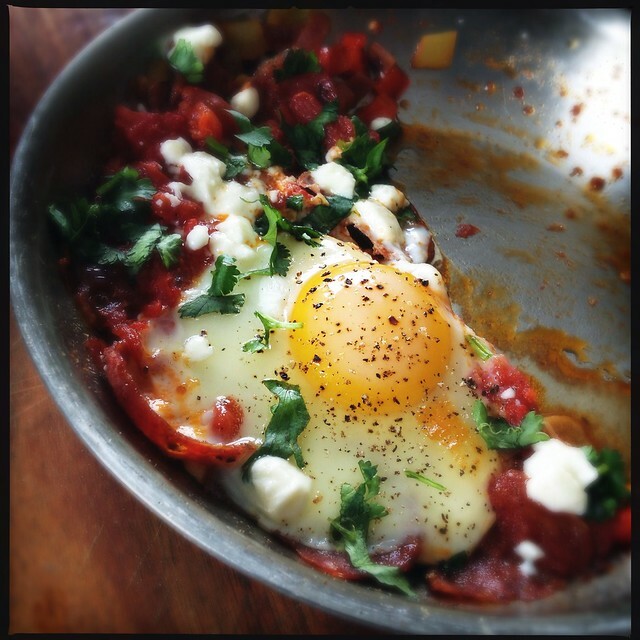 When Cuisine Culture went to Israel and cooked up a couple versions of shakshuka using local cheese, I could think of nothing that I'd like someone to make me than that. But being the only cook in my house, I had to wait until I felt like cooking again to indulge my whims. I actually thought long and hard about using a pork sausage in a dish that seems so inherently Jewish and Muslim at the same time... I also thought about embracing more of a Spanish flare to the simple preparation. But in the end, I just made some good food with some of my favorite flavors. It was perfect and simple and I enjoyed alone for lunch one day. This salami is not overpowering, its smoked paprika flavor not too spicy at all. I chose not to add too much additional spice flavor to let it shine through as it fried in the oil. I actually enjoyed this dish for two days in a row - some might frown on saving a sunny side up egg for another day, but I just popped a lid on the frying pan for refrigerated storage and then reheated the whole thing until it was bubbly throughout. I daresay it was even better the second day - and of course even less work! In a small bowl, mix the tomatoes with reserved tomato juice, cumin, and Aleppo pepper. Use a fork or your fingers to break up any large chunks of tomato. Set aside. In a small skillet, heat olive oil along with the thinly sliced garlic over medium heat. 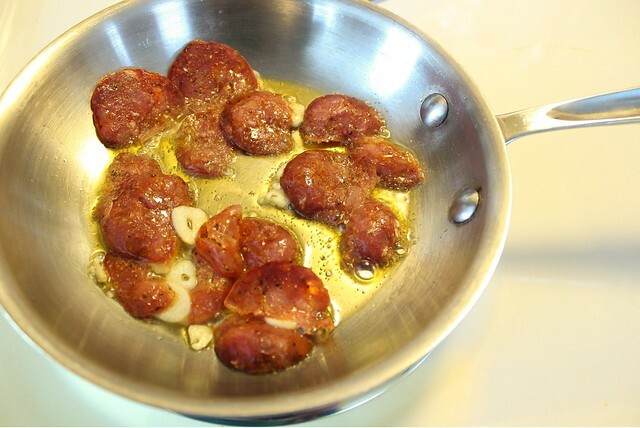 When the garlic starts to sizzle, add the salami and sauté until the salami releases some of its oil and begins to crisp up. Add a bit of black pepper to taste, a few grinds from a peppermill will do. Add the onion, and sauté for about 2 minutes, just until the onion begins to soften a little. Add the peppers, and continue to sauté just until the peppers are crisp tender, 2-3 minutes. Reduce heat to medium low. 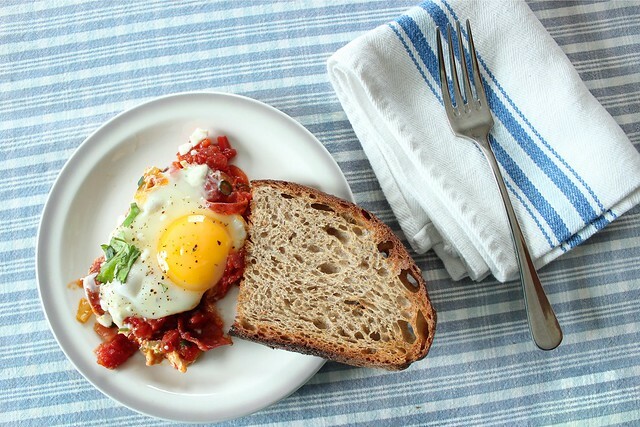 Serve in the skillet with good bread on the side. If needed, add good flake salt at the table. The salami adds enough salt that you likely will not need any additional. Maybe, I knew I'd like this enough that I didn't want to share - and that's why I decided to make this for my lunch on a school day. 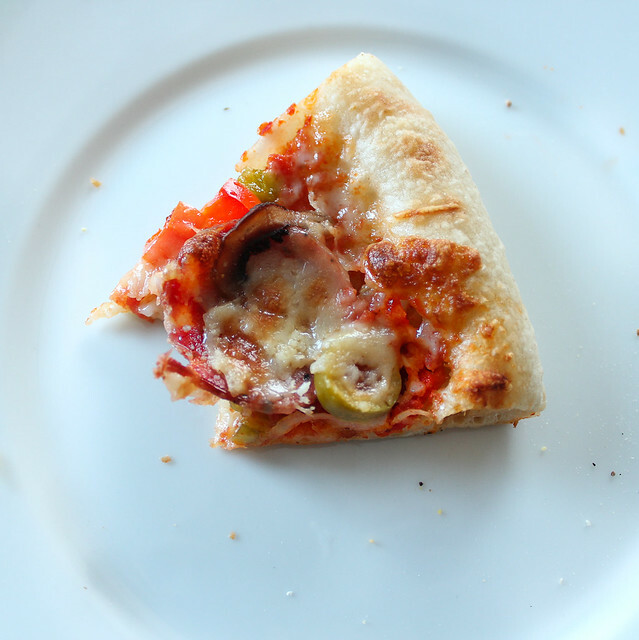 But when our Friday night pizza ritual came around (we've had a solid 2 months of pizza on Friday nights; my son actively helping me by stretching his own dough and topping pizzas himself! ), I sliced some salami for my pizza. One bite by the pickiest member of my family and he was hooked. The kid likes salami pizza. Disclaimer: I did receive this salami free of charge in exchange for writing a couple of recipes and promoting our local man, Scott Baur. Of course, all opinions about Bolzano salami are my own. Having already sampled other Bolzano products, and also having some familiarity with his local commitments to excellence in slow food, I knew I would have nothing to say but complementary things! If you are looking for "Something Special from Wisconsin", look no further!